Make a quick survey with these customer survey templates. Over the years, I've received my fair share of bad surveys. These tend to be easier to identify than good ones -- in fact, you've probably taken some yourself. These surveys often have poorly-worded questions and tend to drag on forever. You might find yourself unable to complete this survey due to boredom, frustration, or the time investment required. 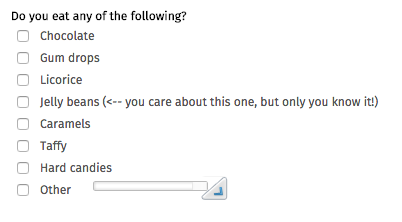 Good surveys, on the other hand, are merely forgettable. 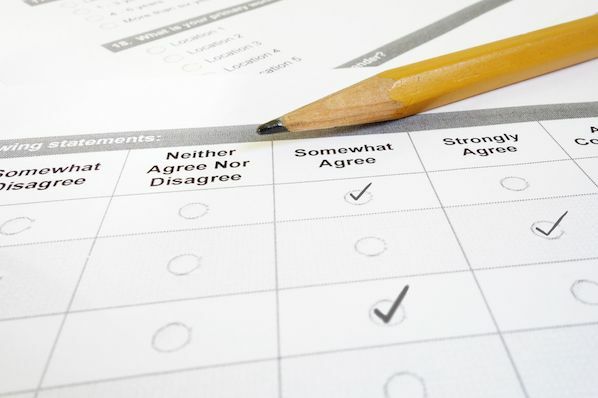 The best experience you can aim for as the creator of a survey is for the respondent to a) finish and submit the survey, and b) think, "Well, that was tolerable." Are you ready to learn how to create good surveys that your customers will actually fill out to provide you with valuable feedback and insights? There are some basic guidelines to make sure people walk away without feeling frustrated from an overly complicated survey wording or design. Below are a few tips you should follow -- along with specific instructions for creating surveys using different tools. Make the survey as short as possible. Don't ask "yes" or "no" questions. Keep your question text neutral. Make sure your question text and answer options allow for every type of survey respondent. Include a "red herring" question to weed out inattentive or fake respondents. 1. 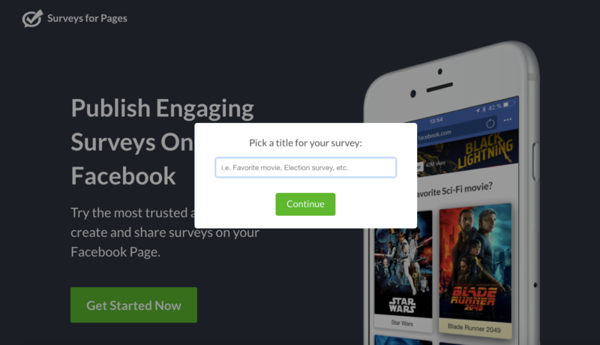 Choose the right platform to create your survey. Choose the right platform to create and share your survey. If you're trying to survey your Facebook fans, your survey should probably live on Facebook. 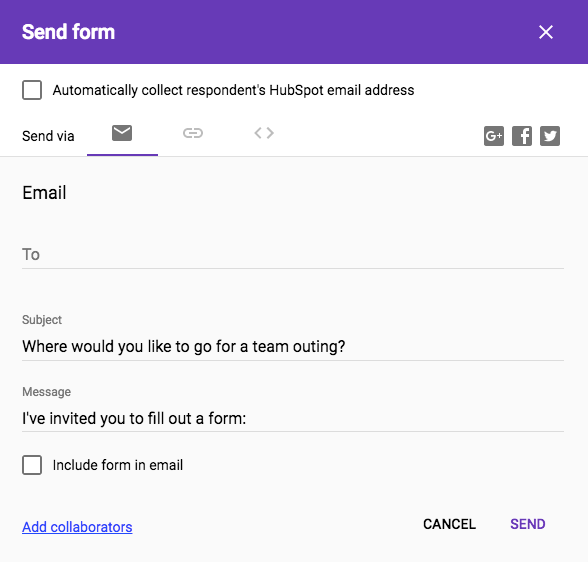 If you want to email your customers a survey, you might want to make your survey using Google Forms. Additionally, think about how you want to use the data. 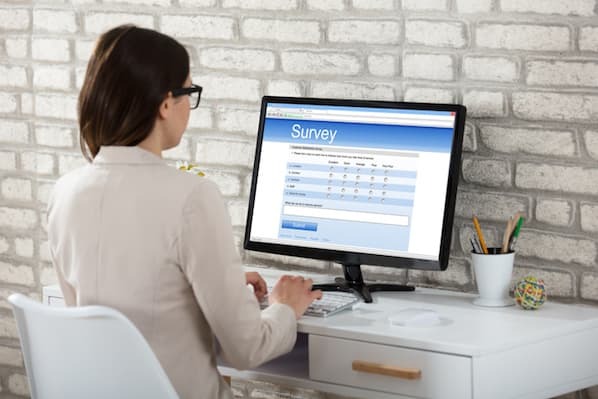 If you're collecting a ton of data that you want to break out and analyze, you should create your survey using Microsoft Excel so you can download the results as a spreadsheet. 2. Make the survey as short as possible. Focus on what's really important. What data do you need to make your argument, launch your campaign, or change a product? Extraneous, "good to know" questions bog down surveys and deaden their focus. Remember that your survey respondents don't really care about what is interesting to you or your company -- they care about how quickly they can finish the survey. It's important to note that drop-offs happen more with longer surveys. 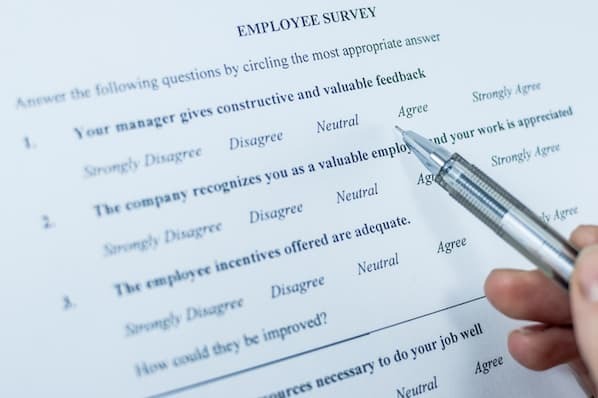 What would your boss prefer: A nice and thorough survey with only 15 completed responses, or a shorter, tighter survey with 200 responses? Probably the latter. If your survey is on the longer side, guide your respondents through the sections. Let them know what you're going to ask them. Give them cues when they're almost done ("In this last section, we're going to ask you …"). If your survey tool allows it (Google Forms does), show them a progress bar so they know how much of the survey is left. And always thank them for taking the time to give feedback. 3. Don't ask "yes" or "no" questions. Respondents have a tendency to answer yes when asked a "yes" or "no" question. It's a psychological bias (unless you ask if they've done something wrong). Instead of asking directly, try to get at the answer in a more roundabout way. Give them a list of options and ask if they use or know any of the items listed. Only let respondents move on if they happen to select the item(s) that you are interested in. Then, you can be sure the people who answer your question are more likely to know what they're talking about. 4. Randomize your answer options. 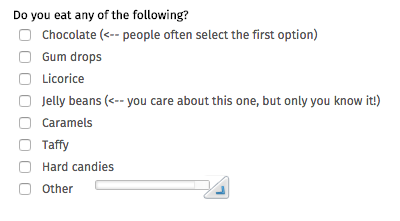 There's also a first-choice bias in surveys, where people automatically click the first answer listed. It's prevalent in "select all that apply" type questions. Randomizing your options helps to combat a survey taker's tendency to check the first option they're given. 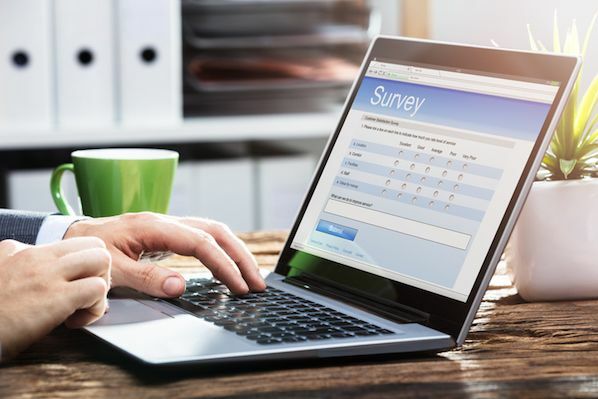 Most survey tools will allow you to anchor options such as "Don't know" or "None of the above" at the bottom of the list and exclude them from randomization. 5. Try to keep your question text neutral. You'll influence your respondents if you ask a leading question. That could suit your needs, but be aware that if you publish your results and people see the leading question text, they may end up questioning the authority of your data. Here's an extreme example to show you what I mean: "Don't you think product X is amazing in the following ways? Yes, it is amazing because of x. It's amazing because of y. It's amazing because of z." Instead, ask: "How would you rate product X on a scale of 1 to 5?" And if you want to know what specifically they like, you can follow up with people who answer 4 or 5 on why they love it. You can do that with the people who answer the lower ratings, too. This gives you way more actionable data on what people love about your product and what you need to work on. 6. Use matrix questions judiciously. 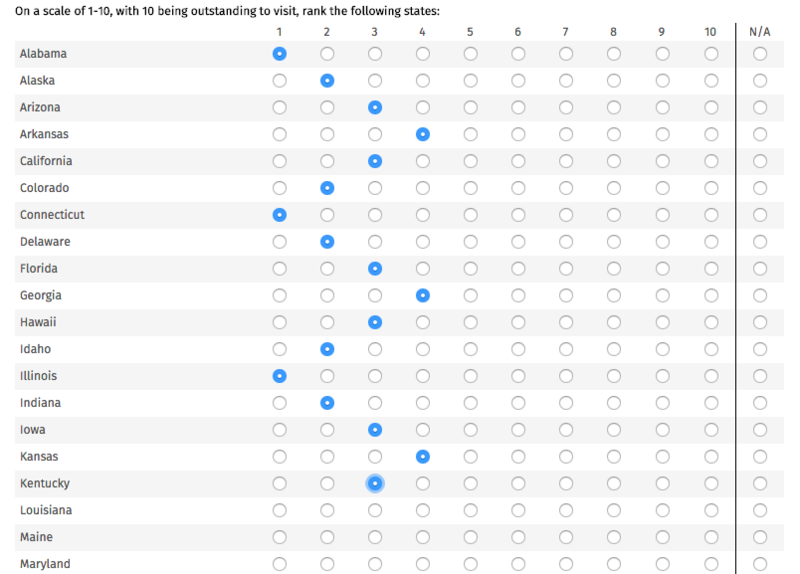 Your survey should not have more than a few matrices. These are for asking complicated questions -- so only use them for questions that really matter. Additionally, each matrix should have no more than 5-7 row or header options to prevent survey recipients from being visually overwhelmed. 7. Make sure your question text and answer options allow for every type of survey respondent. You may live and breathe your product or industry, but you should not assume your survey respondent knows what you're talking about. It never hurts to give examples and explain concepts or jargon to educate respondents who are less knowledgeable than you. Likewise, make sure you give answer options that give your respondent an out if they don't know an answer. A simple example of this is asking if someone's team got bigger or smaller. While it may seem innocuous on the surface, you're actually excluding some possible answers. Maybe the respondent's team stayed the same or the respondent is a new hire and does not know how big the group was a year ago. Make sure you have options those people can select. 8. Include a "red herring" question to weed out inattentive of fake respondents. As a quality check, you can ask a simple demographic question at the beginning and end of each survey. This is especially important when you're designing longer surveys -- because you may be surprised (and dismayed) to see how many respondents forget what country they're from or how many employees their company has. You shouldn't always toss out respondents based on just the red herring mismatch, but you can use it in conjunction with other checks to validate the quality of a respondent's answers. For example, only remove a response if the survey taker failed the red herring and answered "Don't know" for 5 out of 10 questions in your survey. Now that you know what makes a good survey, it's time to learn how to actually start creating one. 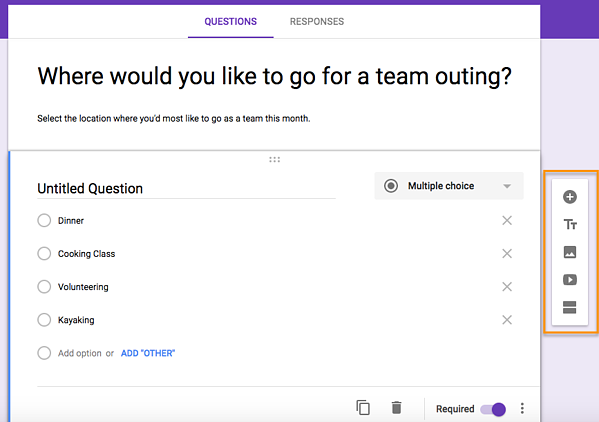 Keep reading to learn how to create surveys in Microsoft Excel, Microsoft Word, Google Forms, Facebook, or SurveyMonkey. Log into your Microsoft Office 365. Select "Forms" from the starting menu in the upper left-hand corner of OneDrive to get started. Give your form a title and a description that recipients will read when they receive it. Select which type of answer recipients will be submitting. Fill in the questions you want to ask, the options you want to offer, and repeat this process, creating new questions until your form is complete. Send it to recipients using the "Share" button in the upper right-hand corner. 1. Log into your Microsoft Office 365 account. You can set this up on OneDrive, or create one for free. 2. Select "Forms" from the starting menu in the upper left-hand corner of OneDrive to get started. Select "New Form" to get started creating a new survey. 3. Give your form a title and a description that recipients will read when they receive it. 4. Select which type of answer recipients will be submitting. Options include multiple-choice, text, a rating system, etc. 5. Fill in the questions you want to ask, the options you want to offer, and repeat this process, creating new questions until your form is complete. Make sure you flip over the "Multiple answers" or "Required" buttons, if applicable. 6. Send it to recipients using the "Share" button in the upper right-hand corner. You can send the survey via email, link directly to it, or embed it on a web page. When you open Microsoft Word, start with a blank document, or search for "form" in the Templates gallery. Click where you want to add content to your survey in the template, then choose the type of control you want to add to the survey field. Input instructional text or drop-down menu options by clicking "Options" in the developer tab where you've already dropped a control. Once you've completed your survey, click the "Review" tab, click "Protect," then select "Protect Document." Share your form with recipients. 1. 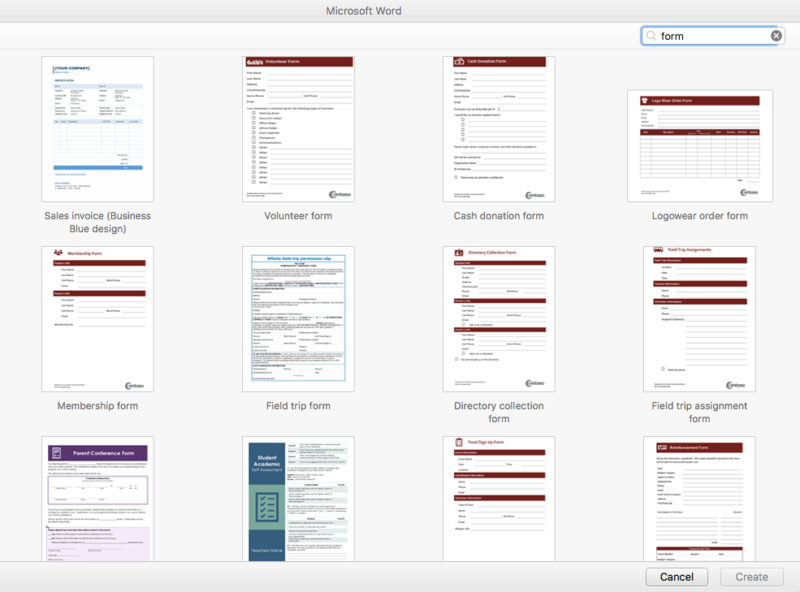 When you open Microsoft Word, start with a blank document, or search for "form" in the Templates gallery. Choose the template that best meets your needs, and click "Create." 2. Show the developer tab. 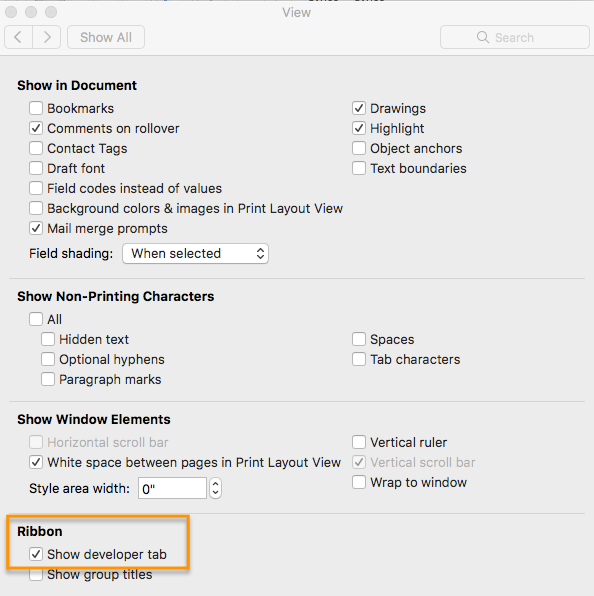 Show the developer tab on a PC by clicking "File" > "Options" > "Customize Ribbon" > "Main Tabs" > "Developer" > "OK." Show the developer tab on a Mac by clicking "Word" > "Preferences" > "Authoring and Proofing Tools" > "View" > "Show developer tab." 3. 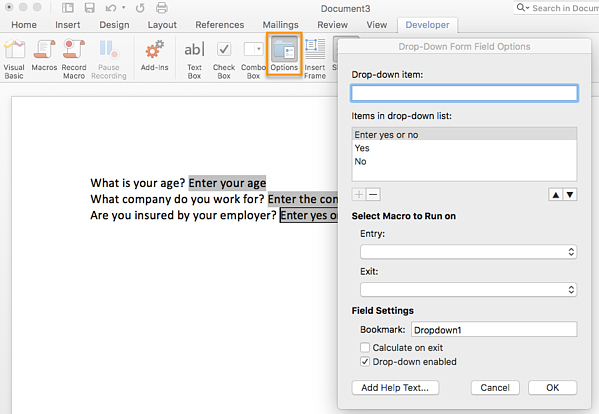 Click where you want to add content to your survey in the template, then choose the type of control you want to add to the survey field. 4. Input instructional text or drop-down menu options by clicking "Options" in the developer tab where you've already dropped a control. This will allow respondents to choose between a set of answer options. 5. Once you've completed your survey, click the "Review" tab, click "Protect," then select "Protect Document." 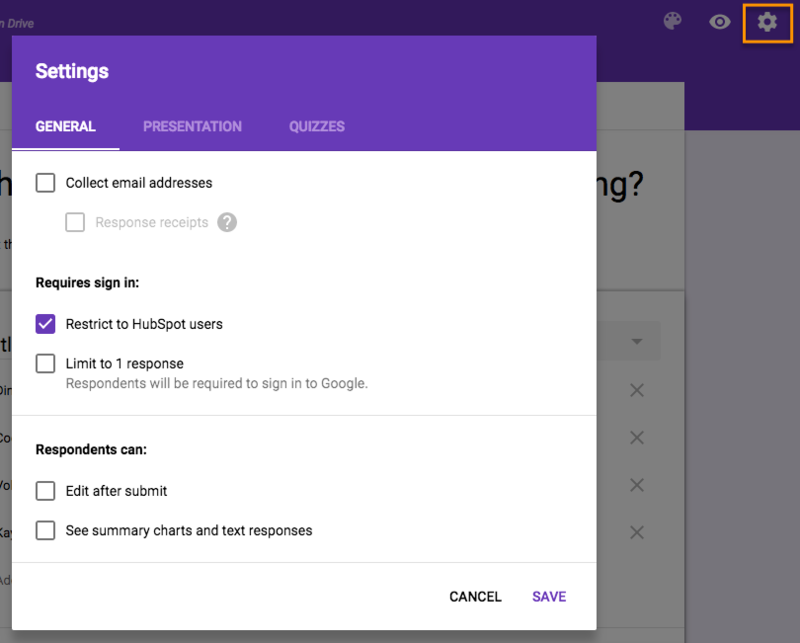 That will protect recipients from editing the questions while allowing them to fill in their own answers. 6. Share your form with recipients. They can fill it out and print, or print and fill it out by hand. 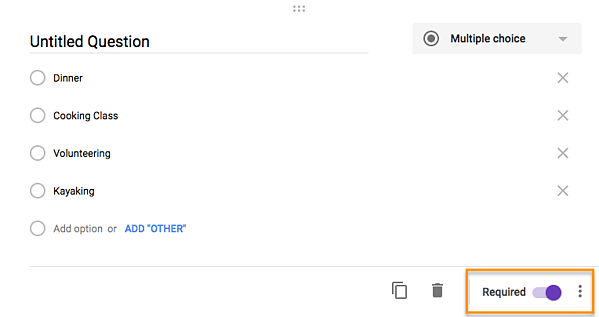 Open your Gmail account menu, and select "Forms." Select a blank form, or use a template from the gallery that best suits your needs. Write a title and description of your survey for recipients. 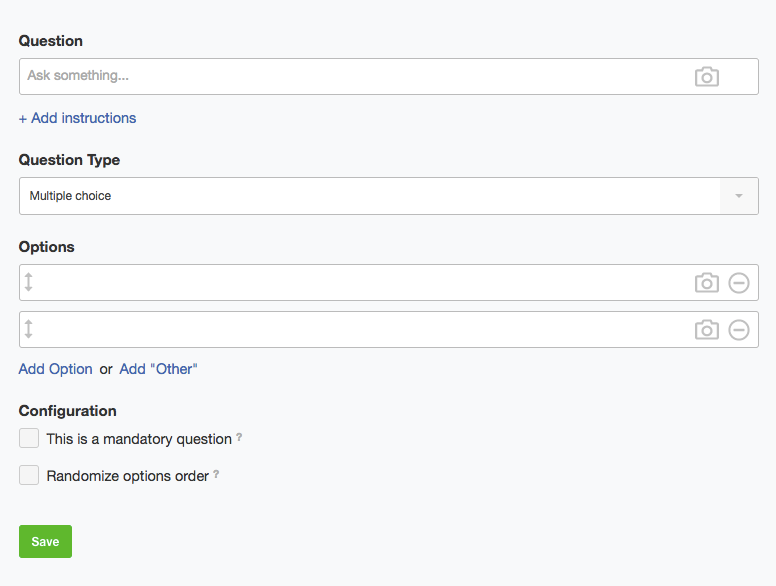 Start creating your form questions by selecting the type of question you're asking. Add multimedia elements, different sections, or different formatting options to your form using the sidebar menu. Adjust settings in the "Settings" gear. Send the survey to the email addresses of your choosing. 1. 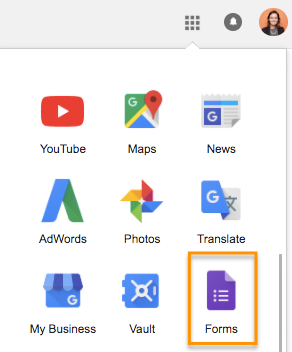 Open your Gmail account menu, and select "Forms." You may have to click "More" to see this option. 2. Select a blank form, or use a template from the gallery that best suits your needs. Options include event feedback forms, time off request forms, and more. 3. Write a title and description of your survey for recipients. Make sure it's clear and properly spelled, as this will be the most prominent wording on the form. 4. 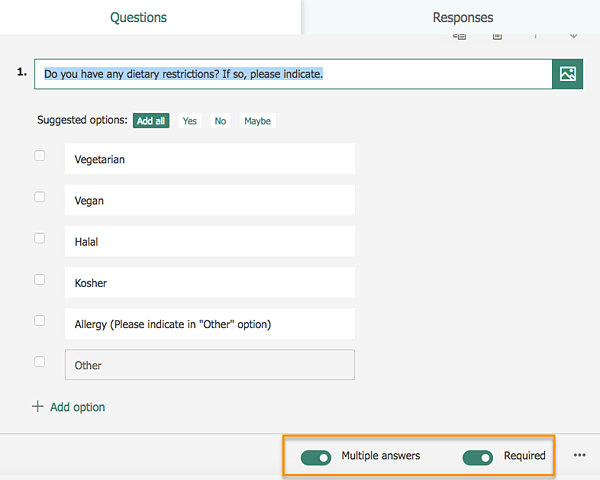 Start creating your form questions by selecting the type of question you're asking. 5. 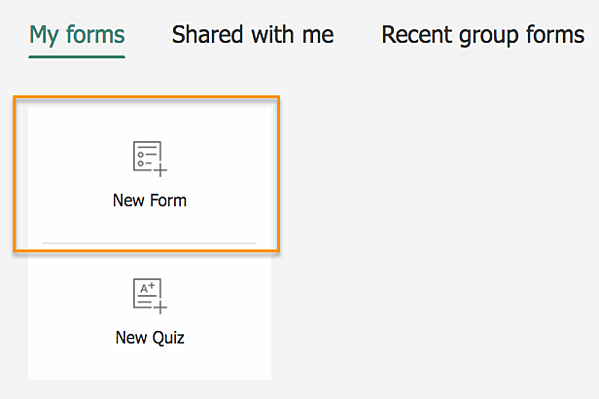 Add multimedia elements, different sections, or different formatting options to your form using the sidebar menu. You can use this to rearrange or break up the order of different survey questions. 6. Adjust settings in the "Settings" gear. You can include options to make the form include a quiz, a confirmation message, and the collecting of email addresses of recipients. 7. Send the survey to the email addresses of your choosing. 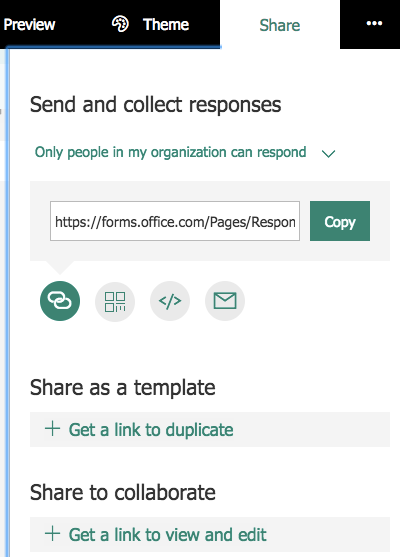 Add collaborators to your survey by clicking the "Send" button in the upper right-hand corner. 1. 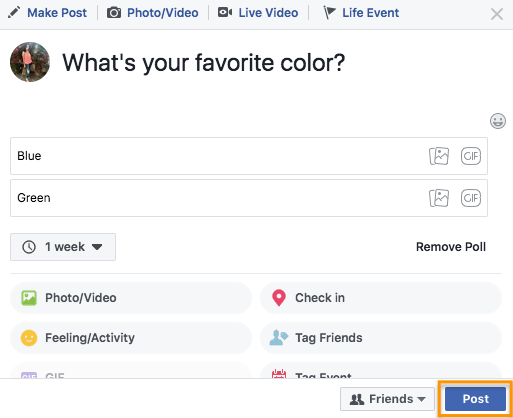 Navigate to your personal profile or your business Page, and head to the post option to create a new post. 2. 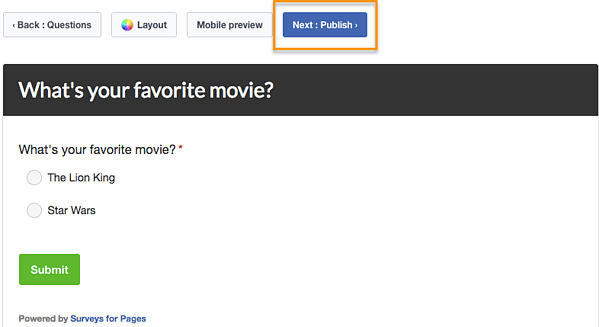 There, you'll select the option to create a simple poll to share with your friends or followers as a status update. 1. 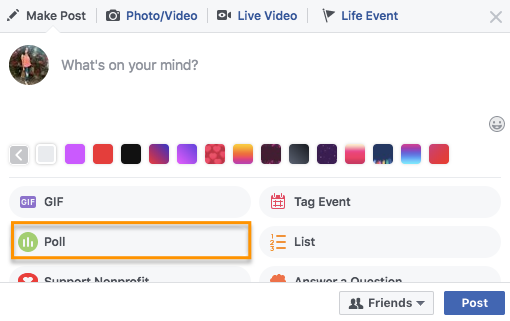 Enter "survey" in your Facebook search bar. Filter the results by clicking "Apps," and select the first option that appears ("Survey"). 3. 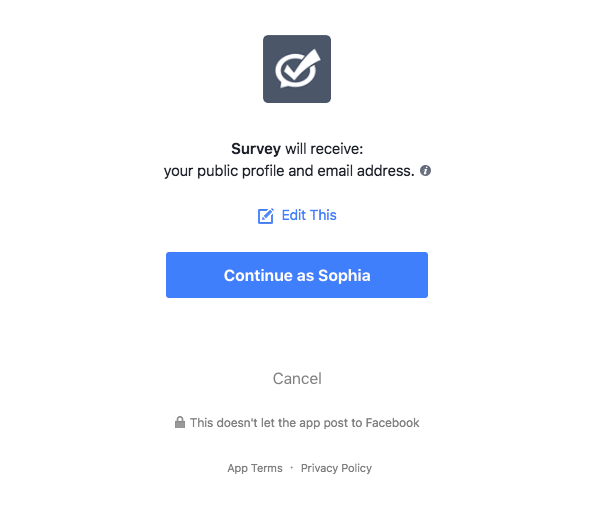 Give Survey permissions to use your profile information. 4. Customize your survey questions and answer options. 6. Publish your survey on your profile or business Page. Select which type of survey you want to create. Add or choose survey questions. Decide how you want to send it to respondents. 1. Select which type of survey you want to create. You can sign up for SurveyMonkey with a free or paid account, and after filling in some details about how you're planning to use it, you can start walking through its survey creation guide. Once you've chosen which type of survey you want to deploy, name it and assign it to a category. 3. Add or choose survey questions. You can start typing in your own survey questions, or you can choose from the questions SurveyMonkey recommends for the type of survey you've selected. 4. Decide how you want to send it to respondents. 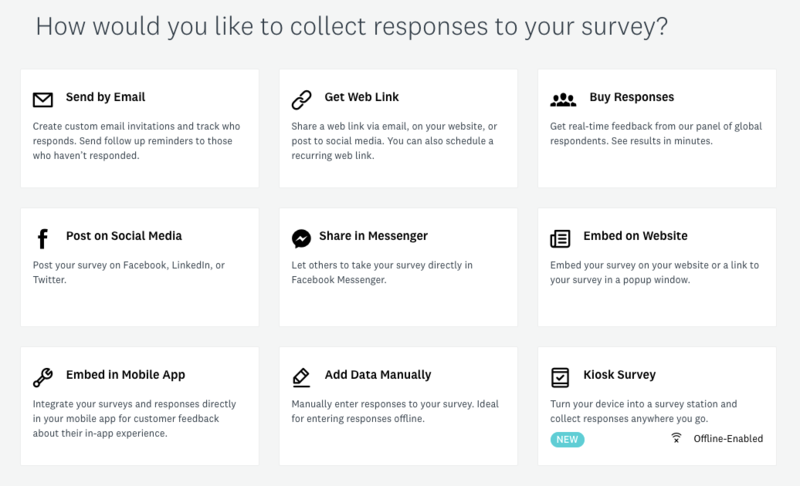 SurveyMonkey offers a variety of different options for deploying your survey, including the ability to buy responses from a broader pool. At the end of the day, you're asking busy people to take time out of their day and give you data you want. To ensure that they have the best experience possible, and that you get the best quality data, try to incorporate the tips above. 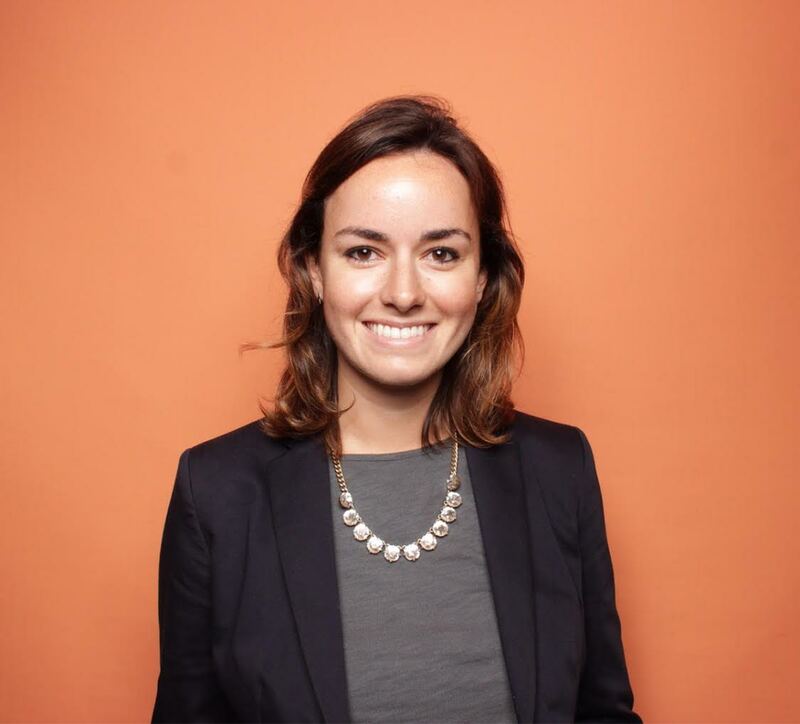 And if you're interested in building forms directly on your website to capture valuable information about your customers, you can try HubSpot's free form builder tool.